Cary-Grove defeated Crystal Lake South 17-3 in a conference game Friday, September 7, 2012 at Crystal Lake South High School. Mike Greene - mgreene@shawmedia.com Crystal Lake South wide receiver Eric Schiller comes up against Cary-Grove defensive back Marcus Thimios after a reception in the second quarter of a conference game Friday, September 7, 2012 at Crystal Lake South High School. 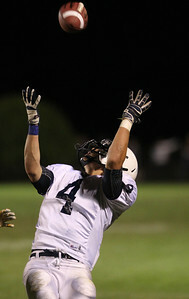 Thimios stripped the ball from Schiller on the play, helping Cary-Grove win the game 17-3. 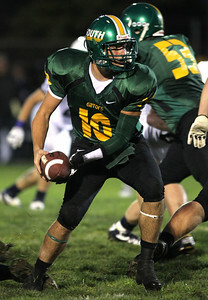 Mike Greene - mgreene@shawmedia.com Crystal Lake South quarterback Austin Rogers scrambles in the first quarter of a conference game against Cary-Grove Friday, September 7, 2012 at Crystal Lake South High School. Cary-Grove won the game 17-3. 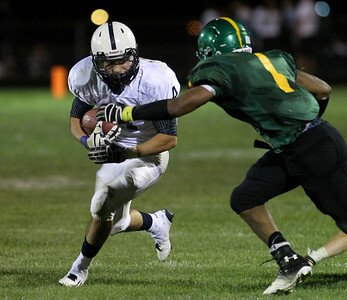 Mike Greene - mgreene@shawmedia.com Cary-Grove running back Ryan Mahoney comes up against Crystal Lake South defensive back Zevin Clark during a run in the third quarter of a conference game Friday, September 7, 2012 at Crystal Lake South High School. Cary-Grove won the game 17-3. Mike Greene - mgreene@shawmedia.com Crystal Lake South quarterback Austin Rogers drops back to pass in the first quarter of a conference game against Cary-Grove Friday, September 7, 2012 at Crystal Lake South High School. Cary-Grove won the game 17-3. Mike Greene - mgreene@shawmedia.com Members of the Crystal Lake South pom team perform before the start of a conference game against Cary-Grove Friday, September 7, 2012 at Crystal Lake South High School. Cary-Grove won the game 17-3. 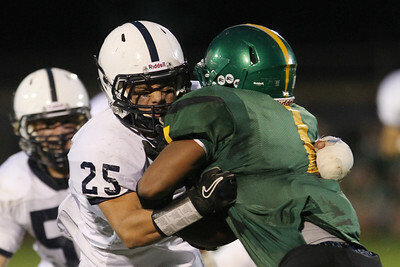 Mike Greene - mgreene@shawmedia.com Cary-Grove defensive back Jakub Ksiazek wraps up Crystal Lake South running back Zevin Clark in the first quarter of a conference game Friday, September 7, 2012 at Crystal Lake South High School. Cary-Grove won the game 17-3. Mike Greene - mgreene@shawmedia.com Cary-Grove running back Ryan Mahoney hauls in a 30-yard pass as Crystal Lake South defensive back Casey Oliver defends in the second quarter of a conference game Friday, September 7, 2012 at Crystal Lake South High School. 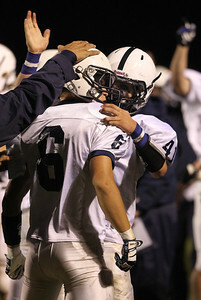 Mohoney's reception set up a Cary-Grove touchdown and the Trojans went on to win the game 17-3. Mike Greene - mgreene@shawmedia.com Crystal Lake South quarterback Austin Rogers prepares to latteral the ball to a running back during the first quarter of a conference game against Cary-Grove Friday, September 7, 2012 at Crystal Lake South High School. Cary-Grove won the game 17-3. Mike Greene - mgreene@shawmedia.com Members of the Crystal Lake South color guard and band perform before the start of a conference game against Cary-Grove Friday, September 7, 2012 at Crystal Lake South High School. Cary-Grove won the game 17-3. Mike Greene - mgreene@shawmedia.com Cary-Grove's Zach Marszal (right) congratulates teammate Marcus Thimios after stripping the ball from a Crystal Lake South player during a run in the second quarter of a conference game Friday, September 7, 2012 at Crystal Lake South High School. Cary-Grove won the game 17-3. Mike Greene - mgreene@shawmedia.com Cary-Grove running back Ryan Mahoney flips over a teammate during a run in the third quarter of a conference game against Crystal Lake South Friday, September 7, 2012 at Crystal Lake South High School. Cary-Grove won the game 17-3. 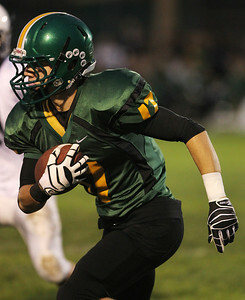 Mike Greene - mgreene@shawmedia.com Crystal Lake South wide receiver Jason Kesseler runs with the ball after a reception in the first quarter of a conference game against Cary-Grove Friday, September 7, 2012 at Crystal Lake South High School. Cary-Grove won the game 17-3. 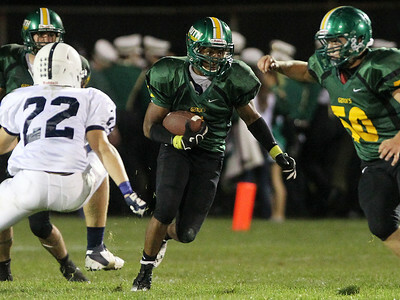 Mike Greene - mgreene@shawmedia.com Crystal Lake South running back Zevin Clark looks for space during a run in the second quarter of a conference game against Cary-Grove Friday, September 7, 2012 at Crystal Lake South High School. Cary-Grove won the game 17-3. Mike Greene - mgreene@shawmedia.com Cary-Grove running back Ryan Mahoney watches a pass in during the second quarter of a conference game against Crystal Lake South Friday, September 7, 2012 at Crystal Lake South High School. 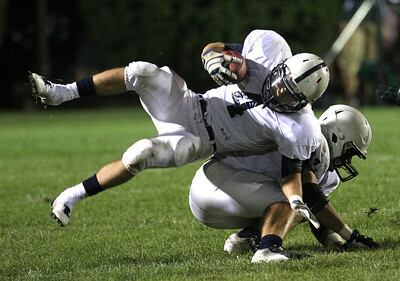 The play was broken up, but Cary-Grove won the game 17-3. Mike Greene - mgreene@shawmedia.com Cary-Grove students cheer on their team in the second quarter of a conference game against Crystal Lake South Friday, September 7, 2012 at Crystal Lake South High School. Cary-Grove won the game 17-3. 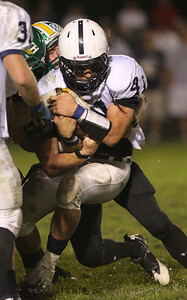 Mike Greene - mgreene@shawmedia.com Cary-Grove quarterback Quinn Baker is takled during a run by Crystal Lake South linebacker Josh Smith during the second quarter of a conference game Friday, September 7, 2012 at Crystal Lake South High School. Cary-Grove won the game 17-3. 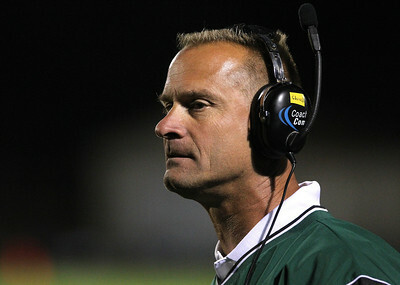 Mike Greene - mgreene@shawmedia.com Crystal Lake South head coach Chuck Ahsmann watches the field in the third quarter of a conference game against Cary-Grove Friday, September 7, 2012 at Crystal Lake South High School. Cary-Grove won the game 17-3. Mike Greene - mgreene@shawmedia.com Crystal Lake South running back Zevin Clark breaks by Cary-Grove defenders during a run in the third quarter of a conference game Friday, September 7, 2012 at Crystal Lake South High School. Cary-Grove won the game 17-3. Mike Greene - mgreene@shawmedia.com Crystal Lake South quarterback Austin Rogers looks for running room during a run in the third quarter of a conference game against Cary-Grove Friday, September 7, 2012 at Crystal Lake South High School. Cary-Grove won the game 17-3. 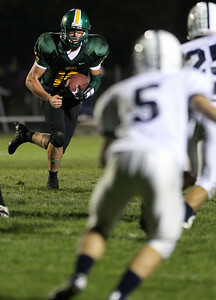 Mike Greene - mgreene@shawmedia.com Cary-Grove kick returner Zach Marszal is wrapped up by Crystal Lake South's Mitch Perik during a kickoff in the third quarter of a conference game Friday, September 7, 2012 at Crystal Lake South High School. Cary-Grove won the game 17-3. 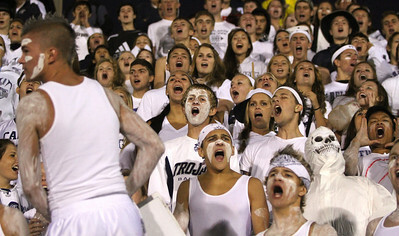 Cary-Grove students cheer on their team in the second quarter of a conference game against Crystal Lake South Friday, September 7, 2012 at Crystal Lake South High School. Cary-Grove won the game 17-3.